The Carolina Panther's defense under Defensive Coordinator Sean McDermott is a unit that typically creates a pass rush with their four defensive linemen. When the Panthers do send extra rushers it is most often a zone dog (rushing 5 and backing it up with zone coverage). Here are a few examples of zone dogs the Panthers have dialed up this season. Here the Panthers aligned in a sub Nickel package. The front creates a pseudo 3-4 alignment by using a DE as a 2 point stance "LB" walked up over the guard. By covering both guards the Panthers force the Cardinal's 5 offensive linemen to account for the 5 immediate interior gap threats (DE, DE, Nose, LB, T). The RB is left to account for the blitzing LB while the blitzing Nickel is unblocked. The coverage is a 2 read coverage. The LB and DE are buzzing through the seams. The Corners and Safeties are playing match up zone reading the release of the receivers. Again the Panthers are in a Nickel personnel. Here they show their double A gap blitz look. The rush is a simple design that allows the 5 rushers to get 1 on 1 rush opportunities. 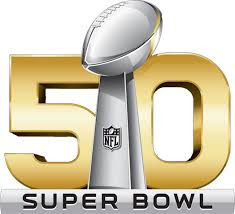 The coverage is a 3 under 3 deep zone concept. 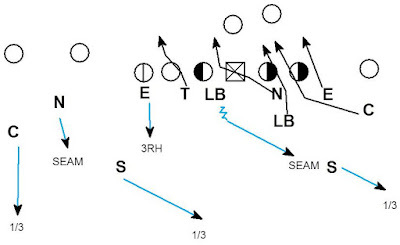 The Safety who gets the interception is able play from his seam across the formation to cover the crossing route. This is possible because the primary threat to his seam (RB) stays in to block in the pass protection. The RB is forced to block the A gap blitzing LB. This occurs because the Center is forced to initially pass set the the walked up A gap LB who ultimately drops into coverage. On paper the offense should be able to block the 5 rushers with the 5 OL. 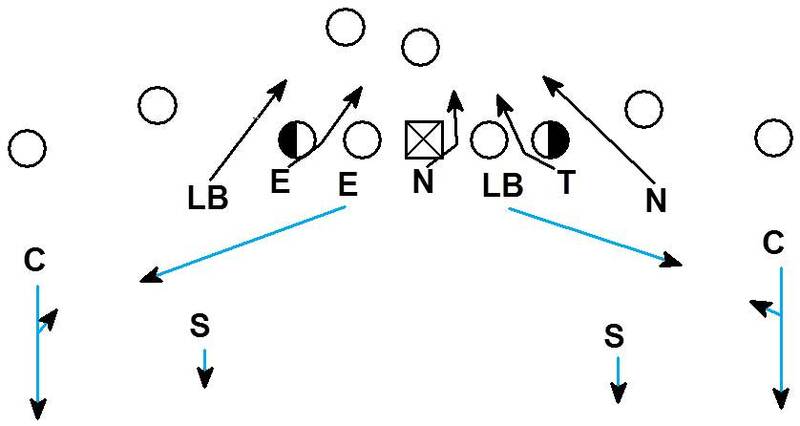 In reality the offense is forced to use the RB in protection and commit 6 to block the 5 rushers. Walking up the double A gap blitz look creates this subtle but effective manipulation of the pass protection scheme. Additionally the Corner is playing an aggressive match-up 1/3 which allows the Safety to play from the seam across the formation without needing to expand to help the Corner with the #1 WR to the weak side. Once again the Panthers are in Nickel personnel. 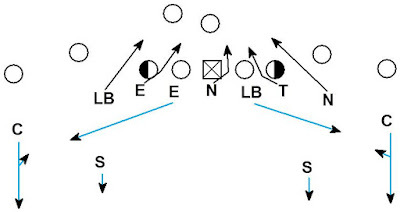 The DE that drops into coverage plays from a 2 point stance. The dropping LB initially shows in the A gap to help attract the attention of the OL. 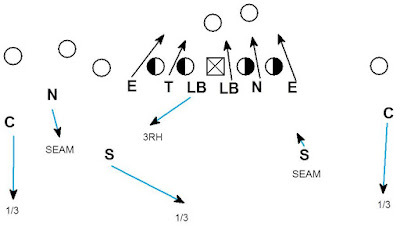 The dog is a overload in the weak side B gap which creates a 2 on 1 vs. the RB in protection. 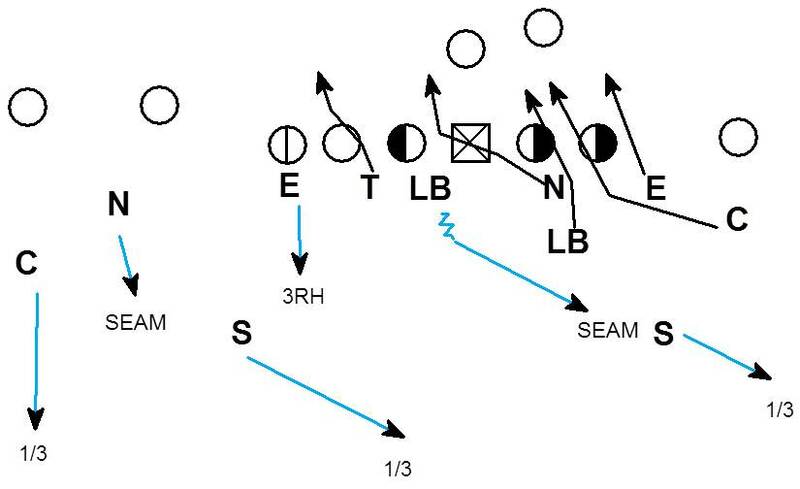 The coverage is a 3 under 3 deep concept with the Safety playing an outside 1/3 to replace the blitzing Corner.